Hey there Friends! 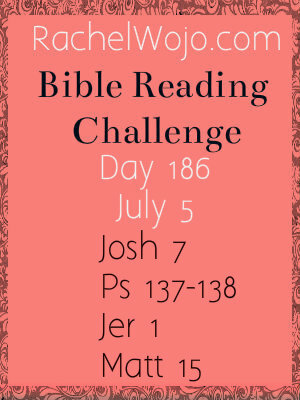 We made it to Friday and with the Bible Reading Challenge, that means it’s time to check in and encourage one another. So I hope you will stop by and leave a comment on the status of your reading, no matter where you are currently reading. I personally just caught up again today and I’m on schedule. Woohoo! I’m excited to make two announcements to you on this glorious Friday! 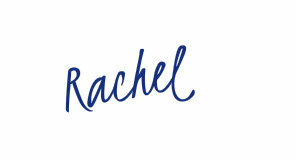 The first is that Reading List is highlighting RachelWojo.com today and their site is offering a fabulous list of 5 favorite posts from RachelWojo.com. 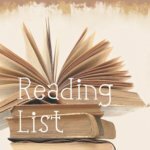 So be sure to stop by and see the Reading List! Post goes live Friday morning. The second announcement is mega-exciting to me! 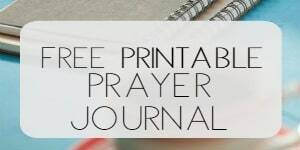 Remember how I searched for a Bible reading schedule for my children, couldn’t find one, and so I created a children’s Bible reading schedule for the book of John? Our children’s Bible reading schedule-now available in app! 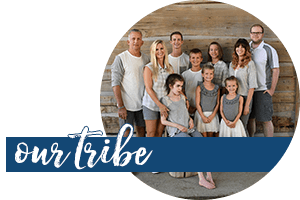 My wonderful friends at The Olive Tree are now offering the Children’s Bible Reading schedule for the gospel of John as a downloadable reading plan within their app!! 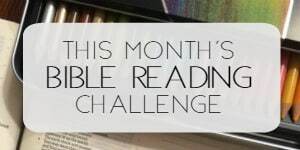 If you are not familiar with their downloadable reading plans, I LOVE the way they perform and currently, the Bible Reading plan we follow here on the blog for the Bible Reading Challenge is the M’Cheyne’s plan. The downloadable reading plan gives you the freedom of starting on whatever day you’d like. So if you’d like to join in where we currently are, just download the app, download the plan and begin on Day 186 today. Available on Ipad, Iphone, Android, Mac and Windows. 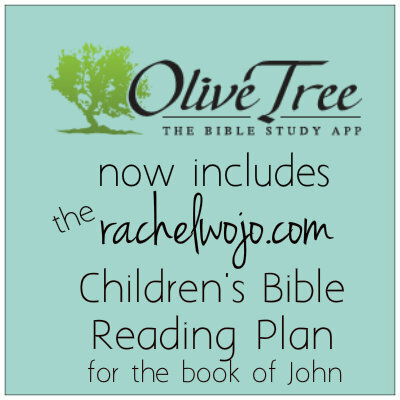 To locate the children’s Bible reading app within Olive Tree, download the app, go to the reading plans, and look for “Children’s Plan.” Then you can download the same reading plan for the gospel of John free printable schedule that has been ever so popular in the last month! Be sure to thank the wonderful folks at the Olive Tree for this new feature! Which children’s Bible apps are your favorite?